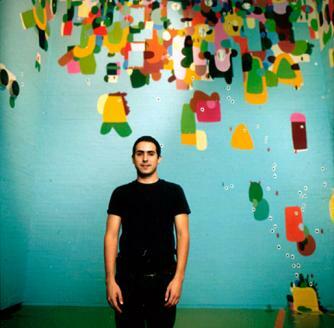 As I did research on Latin American artists participating in the 55th Venice Biennale this year (2013), I found this profile of a very interesting Costa Rican artists—Federico Herrero—who represented his country at the previous biennale. Costa Rica’s capital city is sunny San José, the inspiration and occasional theater for the work of Federico Herrero, a painter who enjoys international success both commercially and critically. Federico Rosa explores the playful yet political quality of his work in this article for theculturetrip.com. Federico Herrero holds an unpretentious belief in painting as an oficio or trade. For him, painting is an involved and intricate craft as well as an act of communication and expression. His work bears a strong visual relation to the tradition of ‘colour field’ painters: Mark Rothko and Morris Louis; artists who made flat colour compositions that intended to avoid a symbolic or literal interpretation, focusing instead on the formal aspects of a painting with colour as the fulcrum. 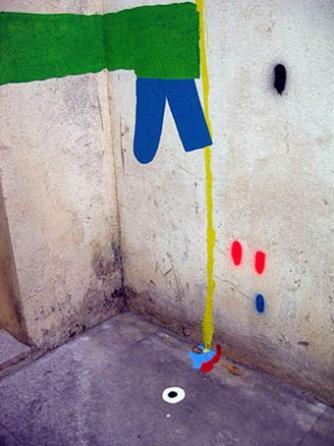 Herrero is similarly infatuated with colour, which is visible in his vibrant works, a unique blend of expression and playfulness that also borrows from the language of street art to create his own brand of socially engaged painting. Herrero first came to prominence at the 2001 Venice Biennale, where the artist, then only 21, painted what appeared to be a haphazard growth of colours in one of the exhibition walls that, nonetheless, were carefully painted shapes that balanced spontaneity and formal elegance. 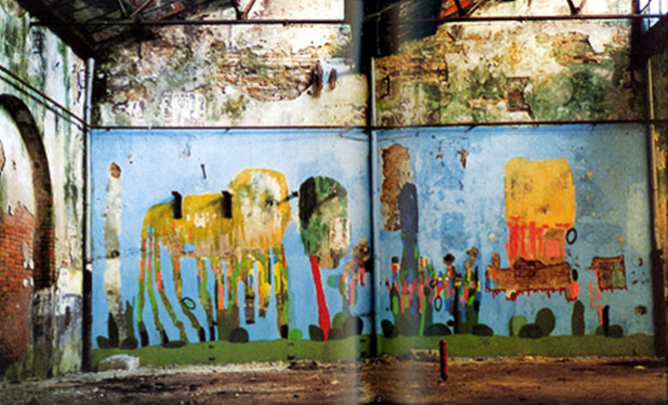 This wall painting is evocative of street art, with vibrant tropical landscapes, and a suggestion of social decay. Herrero deftly managed to incorporate the architectural space in playful ways, adapting it to the final composition. This piece, made within the context of the ‘Plateaus of Humankind’ theme of the Biennale, grabbed the attention of many viewers who wondered at the exuberant colours and shapes in an otherwise neglected, derelict area of the premises. This intervention helped shift the focus to the role of Central American artists in the rest of the exhibition and indeed, within the larger context of the global art world. For these reasons, Herrero went on to win the Biennale’s coveted Golden Lion Prize that year, a prestigious accolade bestowed on the best young artist of the showing. Herrero’s wall paintings place him within the Latin American tradition of muralist painting, especially that of the Mexican Muralists, who were extremely political and very influential across Latin America. Herrera has asserted that he does not see himself as the torchbearer of the muralist tradition, a comment that emphasizes Costa Rica’s neutral stance in political matters: for example, it is currently the only country in the region that does not have an armed force. Herrero has also stated that he feels a stronger connection to graffiti, street signs, and commercial art and design, which directly engage the social space and utilize effective ways of attracting and manipulating the attention of viewers. While always producing gallery-friendly canvases, Herrero’s work is, nonetheless, best appreciated when it drifts off the edges, engaging with the space around it, establishing a direct relation between the social and the aesthetic. 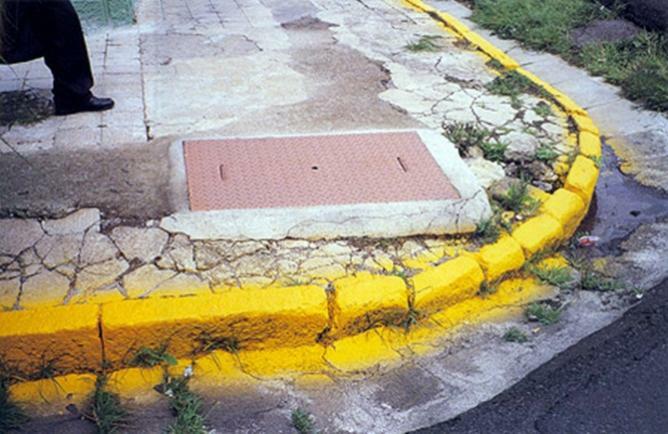 In another street intervention Herrero used the yellow paint normally deployed in street markings to create his own ‘city lines’, often diverging into comical directions and areas of the urban space of San José. Herrero realizes that with simple actions he can reformulate the experience of the city, as well as enter a dialogue with a larger audience than the one that would be limited to a gallery space, without being overtly political or resorting to proselytism. Eschewing traditional painting techniques such as impasto, glazing, shadowing or blending colours, Herrero prefers instead to enhance the purity of his materials, often using acrylic paints that use fast drying binders that not only give a purer, brighter hue, but allow the artist to work much faster and only requires a water to thin. The strength and directness of the colour and the fast drying time allows the work to be performed with a more applied sense of immediacy. Instead of literally translating the world’s outward appearance, Herrero instead interacts with it physically through paint in the language of colours. For these reasons, Herrero’s work stands out among Latin-American artists, paradoxically, because it is socially committed art that is not overtly political or aggressive. Colour in his paintings is the experience; a phenomenon that helps us directly access our community by interacting with architecture and our shared space. In a region where politics in art is par for the course, Herrero flips this notion on its head by employing a playful yet formal approach that engages the viewer’s social awareness without force feeding political ideas. Any reading or interpretation is valid in Herrero’s work. For instance, his paintings are non-referential and do not intend to represent anything objectively. Herrero has, however, referred to fictional characters ‘inhabiting’ his compositions. Primary, basic colours painted in vibrant hues yield strange, cartoon-like forms that never merge into a solid shape; spheres with a dot in the center may be interpreted as eyes; areas of colour they are slapped on could be seen as heads. Herrero is quite content that we could arrive at bizarre interpretations. In certain canvases, Lilliputian shapes are declared by Herrero to be, unofficially, as it were, Martians. While a statement like this may be taken as humor, it emphasizes the subjective nature of artistic interpretation and refutes an absolutist version of objectivity in any aesthetic discourse. Herrero’s faithfulness to colour and shapes, against conceptual or political references, necessarily forces his images to be able to function without resorting to exegesis in order to make sense. In the words of minimalist colour obsessive Frank Stella: ‘what you see is what you see’. With titles like ‘Fuji San’ or ‘Espejo’, Herrero references things that exist in the real world, such as mountains or mirrors, but are deftly rendered irrelevant the longer one interacts with the work. While at first the titles or ‘real world’ references might serve as clues as to what the painting is about, it is only when we realize that making these connections is only part of his game. Seeing the colours for what they are might sound redundant; Herrero makes it essential.